Tim Cook recently hinted that Apple had a few new and exciting products up its sleeve for release later on this year, and although, when he talked of the “new product category,” he was probably referring to the likes of the rumored iWatch, there’s also been a great deal of speculation pertaining to an much larger iPad Pro. We’ve seen and heard plenty regarding the device, which many believe will pack a mammoth 12.9-inch display, and given that such a machine would be stepping into territory currently occupied by the MacBook range, one savvy design team has dreamed up a concept of the iPad Pro running Apple’s desktop OS X operating system. With Microsoft taking steps to amalgamate Windows for both touch-based and traditional, keyboard-and-mouse environments, we’d expect Apple to eventually follow suit. After all, with the 2012 release of OS X Mountain Lion offering quite a few iOS apps and features such as iMessage, Notification Center, Reminders and Game Center, and as the company begins building tablets larger than the entry-level MacBook Air, merging both OS X and iOS would seem the natural, eventual destination. This won’t be happening any time soon, though, and for now, these two very different platforms will be co-existing alongside one another. But this doesn’t rule out the idea of a larger iPad running on OS X, and not only would it make sense given the power of the desktop apps staying true to the “Pro” moniker, but would essentially offer the best of both worlds to those using the slate. 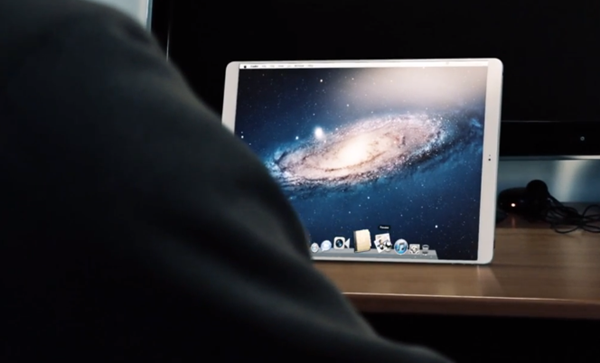 The concept clip has been pieced together by the guys at SET Solution, and as well as hooking up to your standard computer peripherals for a desktop-like experience, the touch-based interface would allow the iPad Pro to be taken anywhere, offering MacBook-esque levels of productivity right from a tablet. What Apple plans to do with the iPad Pro – should the product not amount to yet another figment of the tech world’s own imagination – remains to be seen. But while this concept is rather impressive, one has to wonder whether the convenience of an oversized tablet would be enough to replace the perfectly practical MacBook range for high-end computing on-the-fly. Thanks, Haris for the hat tip!